A versatile wide-angle to telephoto zoom for Pentax DSLRs, the HD PENTAX DA 16-85mm f/3.5-5.6 ED DC WR Lens offers a 24.5-130mm-equivalent focal length to benefit working in a wide variety of shooting situations. One extra-low dispersion glass element and three aspherical elements have been incorporated within the optical design to minimize chromatic aberrations and distortion throughout the zoom range and an HD (High-Definition) coating has been applied to maintain light transmission and reduce surface reflections. Additionally, an SP (Super Protect) coating has also been applied to the front and rear lens surfaces and an overall weather-resistant construction benefits this lens' use in a wide array of working conditions. With regard to handling, a Quick-Shift focusing system enables switching between autofocus and manual focus modes quickly and intuitively by simply rotating the focus ring at any time. 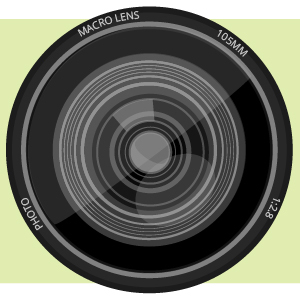 The lens is able to achieve minimum focusing distance of 1.15' along with a maximum magnification of 0.26x. Additionally, a rounded seven-blade diaphragm renders a smooth out-of-focus quality when employing selective focus or shallow depth of field techniques. The 24.5-130mm-equivalent focal length range covers wide-angle to short telephoto perspectives, and is well-suited to use in a variety of conditions. One extra-low dispersion glass element and three aspherical elements are employed to control chromatic aberrations and distortions throughout the zoom range in order to produce greater clarity and color accuracy. An HD coating has been applied to optimize light transmission, improve contrast, and reduce surface reflections. The front and rear elements feature an additional SP coating for protection against smudging, fingerprints, dust, and other elements. Quick-Shift focusing system permits fast changing between auto and manual focusing modes, with the ability to manually override the focus position at any point. Additionally, the DC autofocus motor also provides quick, smooth, and quiet performance to benefit both still and movie capture. Weather-resistant construction with 11 seals benefits its use in inclement conditions. 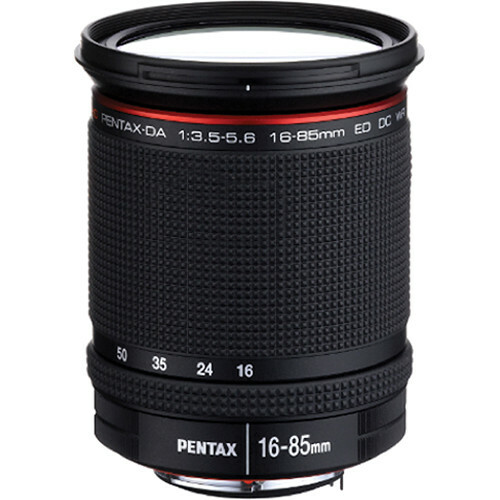 Box Dimensions (LxWxH) 6.1 x 4.3 x 4.3"
HD PENTAX DA 16-85mm f/3.5-5.6 ED DC WR Lens is rated 4.4 out of 5 by 60. Rated 5 out of 5 by Doc from Superb Lens This is a follow up to my earlier review of the 16-85mm lens on 12/24/15 which was exchanged by B&H due to very poor image quality. The replacement lens I received a few days ago is as different as chalk and cheese to the one I returned. The construction and finish of the lens is excellent with a really smooth and firm zoom action with zero barrel creep. The image is sharp with good contrast and color rendering is very accurate at virtually all apertures and focal lengths, I have a similiar lens by a leading camera company and this Pentax lens is better in many areas. I am delighted with the lens and very pleased that B&H exchanged it fast and with no hassle. Rated 3 out of 5 by Alex from Great specs, but did not compare well... I was very excited to get this lens. It promised great replacement for my old trusted 4/16-45, expanding telephoto end and offering weather protection to match my K-3. While testing it side by side with my old lens shooting landscapes, I discovered that sharpness at 16mm, where I use it most, was visibly worse, especially at wider f-stops. I thought I got a bad copy, so I returned it and ordered a replacement. Unfortunately, it had exact same issue. I don't think it is a bad lens - overall I was quite impressed, maybe I just got very lucky with my old 16-45. So, sadly, the lens went back to B&H. Rated 5 out of 5 by Old Hobo from HD Pentax DA 16-85 The reason for the purchase of this lens was to find something better than my Pentax 18-135 and sigma 18-250.This lens (16-85)in the overlapping range is a much better lens in every aspect.This includes sharpness,contrast and color.Comparing this lens to a sigma 18-35 that I have,the sigma is sharper but not by much plus in my opion the color is better in the pentax.it shares a trait with my sigma 8-16 that when pictures taken with the sun in the frame or other bright reflections ie off water it produces great starburst even at low f/stops.The build quality seems to be on a par with the pentax 18-135,in fact it looks identical except for size.As far as the optics go I believe it is very close to my 60-250*. Rated 5 out of 5 by Anonymous from A great match for the K3 II I bought this lens when I purchased my K3 II. I was looking for a sharp clear lens that was able to go fairly wide and still have a respectable zoom. The picture quality has been remarkable. When matched with the K3 II's in-camera correction capability it is so crystal clear and sharp that I never bother with trying to sharpen photos in post processing anymore. For landscapes the wide angle of the 16mm (similar to 24 mm on a full frame camera) is exactly what I was looking for. I sometimes lament not being able to zoom beyond the 85mm top end ... so I picked up the 55-300 zoom for those times when that is needed. Overall, a very fine lens. Rated 5 out of 5 by Seah from Very sharp zoom. Fast focusing. The 1st lens was faulty. The zoom ring jammed and parts fell out from the interior of the lens. I was so disappointed. I contacted B&H and was given a prepaid UPS label. I order a 2nd lens and it is working fine. The focusing is fast and the photos are sharp. A little PF at the edge of 16mm but it is not a deal breaker. However I did notice a small bug in the firmware(?). I don't know if it is the lens' fault or my K-5IIs'. Sometimes it will fail to re-focus if the focus is just out. A turn of the focusing ring to make it very out of focus will kick start the DC motor again. It is very hard to duplicate the problem. It only happens in certain conditions of which I am not sure of. Rated 4 out of 5 by Timothy W. from Excellent lens I agonized over the purchase of a zoom lens since I have a number of very good primes (Pentax Limited series) and thought I wanted a faster lens. A lot of recent city hikes and an upcoming walking tour convinced me it was time to lighten the load, and the recent sale on this lens pushed me over the top. I couldn't be happier. The lens focuses quickly, accurately and quietly. Pictures are very sharp and minimum focus distance lets me take quasi-macros. Not stressing about the camera and lens when it starts to rain is a huge bonus. I should have bought this lens long ago. Rated 5 out of 5 by Railtycoon from WOW Great Lens I have the DA* 16-50mm but the pictures I get with this lens are superior, I don't know why, they just are. The focus is almost instantaneous and silent. Focus lock is accurate. Bokeh is excellent. Sharpness is excellent. Saturation is excellent. My pictures POP. It is a little smaller and lighter than the 16-50mm and I don't really miss the extra aperture of the 16-50mm because the K-3 I use it on is a very good low light performer. I also have made good use at the long end the 16-50mm doesn't have. I don't hardly use the 55-300mm anymore. Great walkaround lens. The price made me hesitate but you shouldn't! Rated 4 out of 5 by Kjell V. from Versatile and good image quality. I have had this lens for some months now, and I?m very happy with it. This is my on the go lens, and is attached to my camera most of the time. ?The image quality is good, versatile zoom range and it is weather protected. ?All important things for general photographing. I have som problems with AF. ?Some times the lens won't focus. ?I then have to zoom out, refocus and zoom back to focus again. ?It normally happens around 25mm. This is an excellent tourist lens to leave on the camera. When I are on assignment, I seldom use this lens. ?Then I uses other lenses for better sharpness, better dof, better aperture and so on depending on the assignment. Is the lens barrel (including the extension), made of metal or composite (plastic)? Is this lens made of metal or plastic?